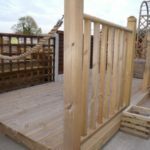 We can supply all the timber items you need if you are looking to build a deck in your garden. 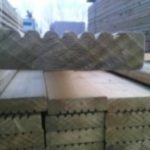 We have large stocks of softwood decking materials to suit any designs you might have. 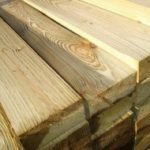 All our decking timber is pressure treated to ensure long life. The treatment is environmentally and pet safe and will prevent your decking from rotting or damage from insect attack. 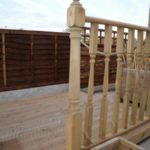 We have a wide range of boards, joists, spindles, handrails and posts to suit all decking ideas. We supply three sizes of deck joists : 8 x 2 inch (200mm x 50mm), 6 x 2 inch (150mm x 50mm) and 4 x 2 inch (100mm x 50mm). All sizes are available in three lengths 3.6m and 4.8m. The larger joists are ideal for raised decking areas with larger spans, the smaller joists are great for use directly on the ground – if you need advice on which joist is suitable for your needs call us on 024 76 588 909. 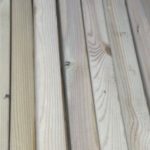 Our deck boards are available in one cross section size of 120mm x 28mm (4.5 inch x 1.25 inch) and three different lengths (3.6, 4.8 and 5.4m). These are extra thick boards, tanalised treated, planed timber boards for a smooth finish with decking groove profile to one side and plane on the other. The boards are best attached to joists with deck screws. View our selection here . We offer three different types of spindle and a single style of handrail/base rail. The spindles we offer are turned spindles, plain rectangular or fluted spindles. Spindles are formed from 41mm x 41mm timbers and are 900mm long. 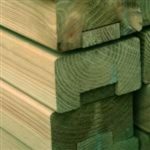 Our base rail is available in 2.4m lengths and is a planed treated timber moulded section. We offer two styles of newel post – a plain rectangular post and a turned newel post. 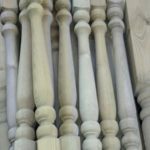 The rectangular newel post comes with a weathered top, the turned newel post comes with a ball top. If you have any questions about our range or need help deciding on quantities please don’t hesitate to call us on 024 76 588 909 for further details before ordering.